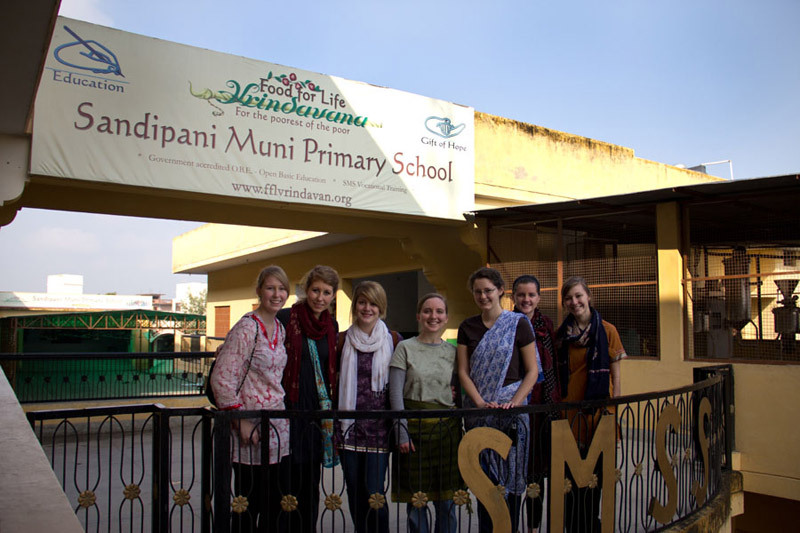 I volunteered at the Sandipani Muni School in Vrindavan, India from December, 2011 until January, 2012. 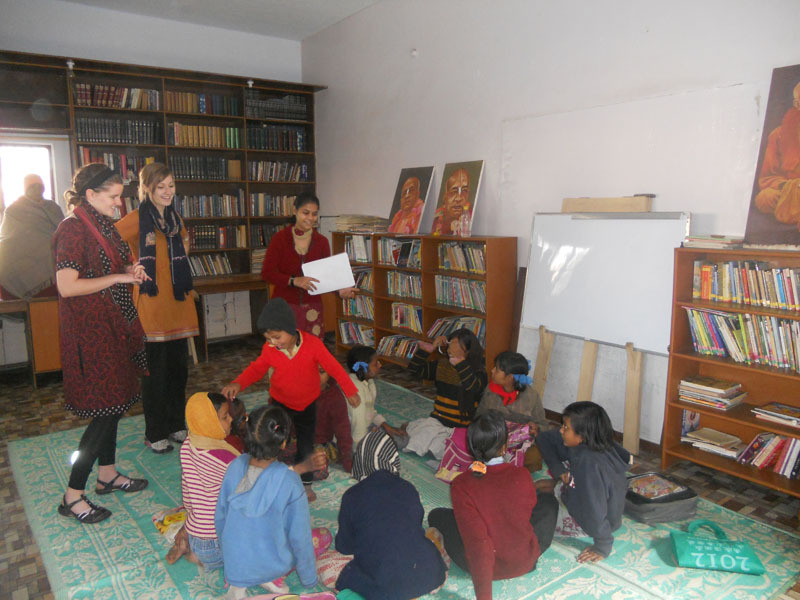 I worked in a school, teaching basic skills to children as they learned the English language. 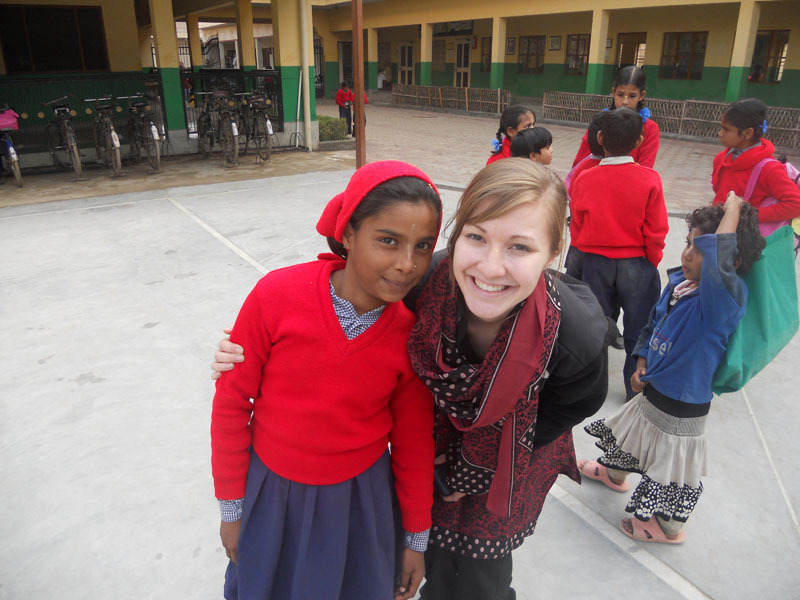 I have always enjoyed doing volunteer work locally, but had never really thought about doing work abroad until I found some information on this specific trip. There was a picture attached to a mass e-mail that was sent regarding the trip, and it really caught my eye. It showed two little girls from the school that needed volunteers. The image made me fall in love with the idea of going somewhere completely unlike my home. What enticed me about the trip was that it was to a place I’d probably never get the opportunity to travel by myself. I wanted to go somewhere that would make me step out of my comfort zone. I needed to prove to myself that I could be independent, and my experience definitely challenged me to solve problems on my own. Having two incredible trip leaders along with us certainly helped! They guided us through every obstacle we faced, while still giving us the freedom to overcome challenges independently. They were always extremely comforting and reassuring, and they really became like parents to me while I was abroad. They weren’t in any way overbearing, and they really exposed members of the group to the local culture. They were always available if we needed someone to talk to, and they always wanted everyone’s honest opinion about how they were feeling each step of the way. At the end of each day we’d go around a circle, recounting our highs and lows from the day. This was a great activity that helped me process everything I was experiencing. While volunteering at the school, I saw how the children had a true desire to learn because they considered it a privilege. Back in the US, kids dread going to school and are constantly complaining about it – but these kids were so appreciative of the opportunity they were given to be educated. When the children were asked what they would wish for if they could have any three wishes granted, every child responded with “education.” At home you’d hear kids rattle off toys or games that they wanted. I was so impressed by how these children saw what was truly important. It showed me how much people living in poverty value everything they have – especially basic items that we simply take for granted. Throughout the trip, this was a very challenging obstacle to overcome. Many people stared at us even though we were covered head to toe in their traditional clothing, trying to show our respect, and attempting to blend in. Unfortunately, people saw right past this and were amazed by our white skin. People would take photos of us or sometimes just point and laugh. This became very discouraging especially after we tried so hard to be respectful of their culture. Eventually, we just had to ignore it and focus on the people who appreciated us for the services we brought to them. There were so many people who saw us for who we were and not what we looked like, and it was really helpful to remember that when we were the center of attention on the streets. I really missed my family and boyfriend while I was abroad. It was challenging to leave the ones that I am so close to, but it also allowed me to prove to myself that I could do it. I felt extremely accomplished after my trip, as I had overcome my fears of being without my friends and family. My time abroad proved to me that I really can be independent, and I don’t think many other experiences could have done that for me. 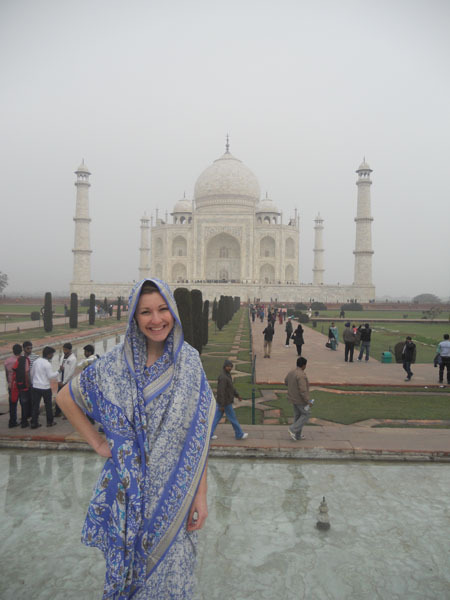 An event that really stood out to me occurred on my first day in Vrindavan. A religious leader who had offered to show us some important landmarks led our group around the city. He took us out of the absolute chaos of the city into a peaceful farmland. It was amazing to find such tranquility just minutes from the city. As we were walking through the farms, the leader brought us to a friend’s home. The home was anything like what I am used to seeing back in the US, with a roof made of straw and no doors or windows to cover the open frames. The family was dressed in dirty clothing and appeared to be very poor. The mother was making bread and when she finished, instead of handing it out to her tired husband or hungry children, she gave it to our group. It absolutely astounded me that a family with so little would give up the few resources that they had for strangers. This generosity was seen again and again with the people of Vrindavan. It amazed me how grateful they were for us being there, without even knowing what purpose we served. I am currently studying occupational therapy and I would love to incorporate some work abroad into my future career. I truly love working with other cultures, and it would be a great learning experience to be able to incorporate the occupational therapy skills that I have learned in an international context. My program offers two trips: one to Brazil and one to Ecuador, which both sound incredible, but I don’t know how possible either of them would be financially especially after my trip to India. For information on volunteer and internship positions in international health, check out the section NGOs & International Development which includes the All NGOs resource list, which can be filtered by region and has the largest list of US NGOs available anywhere, many of which operate in the international health field. For more advanced information on how to break into the international health sector, see the Health Careers Abroad. Find out how you can teach English abroad to finance your overseas travel while building career experience with Teaching English As a Stepping Stone to Your International Career. Lastly, consider articles and resource in Building Experience While In School. Note that there are many student clubs that promote international health issues, see the full list in our resource list International Associations With Clubs On Campus.